The Anion 135 is a slightly heavier version of the Cyano 115. It features a teardrop head shape and comes with a 335 mm balance point for great maneuverability. d3o™: The frame-inlay d3o™ is a smart material. The specially designed molecules in d3o™ react on different impacts within nano seconds. They stay soft during slow hits and lock together on hard strokes. With this behavior, d3o™ is able to sense the needs of your play and adapts to you. 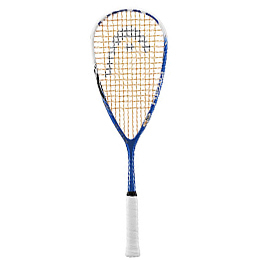 It provides maximum power as well as softer touch for a better feel. YouTek™: YouTek™ combines superior technologies to perfectly match your individual needs. Whether your game is aggressive and adventurous or consistent and smooth, YouTek™ enhances your performance and brings out the best in you. Teflon® Friction Reducing Polymer: Allows minimal string friction and creates a bigger "sweet spot" through the even distribution of tension across the entire string bed. Strings do not lose as much energy and can move freely around the grommets offering the player more power and feel on the racquet. Corrugated Technology: A revolutionary shaft deign that optimizes power. Corrugates rails are incorporated into the shaft of the racquet creating up to 12% more stiffness than a conventional racquet design. This provides superior torsion, blending and handling for optimum power in every single shot.